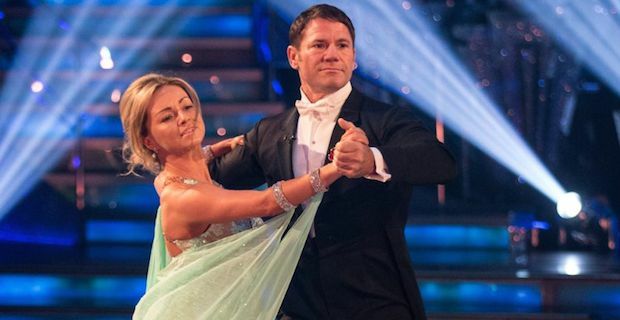 Strictly Come Dancing stunner Ola Jordan has had some interesting things to say about her dance partner Steve Backshall. Apparently the thinks that he the TV Wildlife presenter is "lethal" to dance with and also hinted at having some frustration that he doesn't seem able to pick up their new routines quickly enough. The 32 year old dancer from Poland has been a mainstay on the BBC show ever since first appearing in 2006. She is partnered up with 41 year old Backshall this season and they have had some shaky performances together, most notable while attempting the Cha Cha Cha. But it hasn't all been bad and the duo even managed to score a respectable 30 points with their Waltz routine to I Wonder Why. Backshall has managed to secure a nickname of "Tarzan" due to his strong physique and his sheer strength. Jordan explained some of his struggles saying "The waltz is about balance, grace and elegance all of which Steve struggles with. Even he jokes that he is more of a grisly bear than he is a swan. It’s lethal dancing with him too." Jordan seems to be able to pinpoint exactly why it is so challenging dancing with Backshall adding “Steve is very strong and he doesn’t quite know his own strength. The week before last we performed the Salsa and in rehearsals he totally mistimed one of the lifts and I was nearly thrown over his head but thank god I am alive." It has been reported that Jordan may also be leaving the BBC show once this season ends after expressing a wish to start a family with her former Strictly dance partner James Jordan. A source close to the pair told the Sunday People "She and James have been talking seriously over the past few months about trying for a baby, they have been married for 11 years and are definitely ready."